The Barytone, a string instrument closely related to the viola da gamba during the 18th century was known throughout the region of South Germany and Austria. It has 6-7 strings being tuned and played like a bass viol. In addition to that there are 9-28 resonant metal strings going through the neck, which can be plucked with the thumb of the left hand. There have been also instruments with a 3rd set of strings, which can be plucked with the thumb of the right hand. The oldest, so far known instrument was built in Vienna 1647 by Magnus Feldlen. to the Duke of Württemberg. 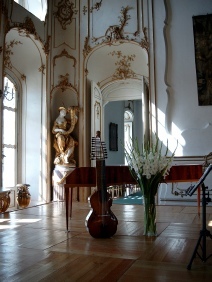 In the late 18th century the instrument was used in the Vienna Opera house (compositions by Ariosti and J.J. Fux). There are also documents of virtuosos of the Eszterhazy Kapelle (Andreas Lidl) travelling to Paris and London (e.g. Charles Burney describing a concert in London). But if it were not Haydns Baryton Trios, the instrument would be forgotten today, for its complicated way to build and to play it. Nevertheless its wonderful sound is worth while putting it to live again. Prince Nikolaus Eszterhazy loved the instrument, played himself and had J. Haydn compose during 10 years more than 150 works for this instrument. There are at least 5 people known, playing Barytone in his “Hofkapelle” and some other composers wrote beautiful chamber music for them, so for example Luigi Tomasini.